CloverDX Designer needs activating before you can use it. If Designer without a valid license starts, you are instructed to activate it. Click Activate using license key to activate the Designer. If you do not have a license key, the I need a license key button opens a web page where you can get a trial license. Offline activation, if you have license key. Online activation, if you have license number and password. You should have received the license key by an email. 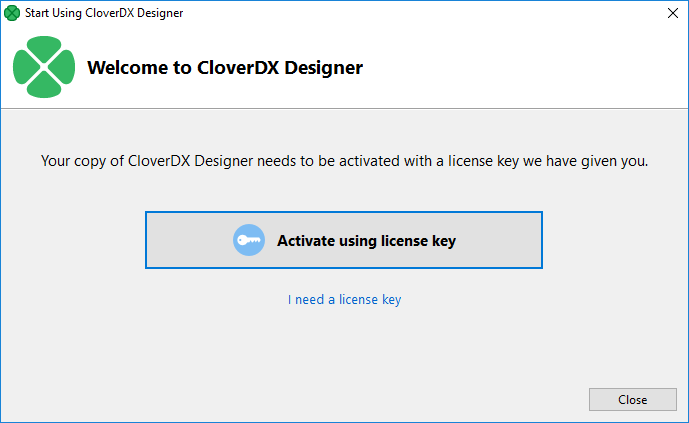 If you are installing a trial version of CloverDX Designer you got the license key after the registration. The license key can be also acquired on your CloverDX Account: log in at www.cloverdx.com/login and under the section Download you see a View license key button.